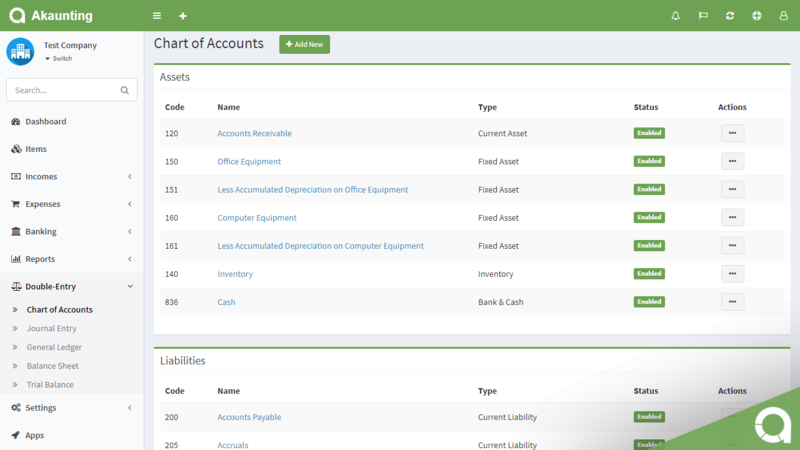 Looking for Chart of Accounts, Journal Entry, General Ledger, Balance Sheet, and Trial Balance? 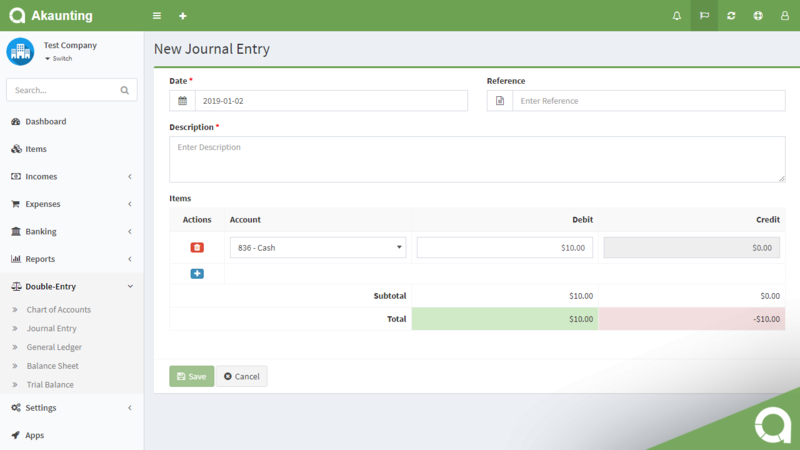 This app brings the double-entry accounting features to Akaunting. 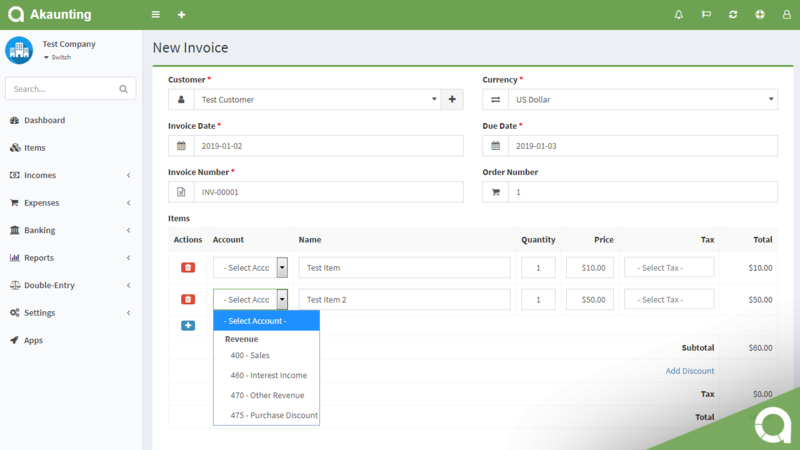 Akaunting ships with single-entry accounting feature set. However, some of the businesses, whether they use the cash-basis accounting method or the accrual accounting method, use double-entry bookkeeping to keep their books. Double-entry accounting is a practice that helps minimize errors and increases the chance that your books balance. If you're an accountant, thanks to the multi-company feature of Akaunting, you can manage the financials of unlimited companies using this app. Install the app within one click from your Akaunting admin panel, Apps > Double-Entry page. This app turns Akaunting into something actually manageable. Love the ability to track in and out between accounts time easily. i just wished if there is a way to give the journal-entry to give each line a separate description. i do use it a lot and i need to give each line its description better than make each entry with only one line with its description on the only top text field. Accounting was probably the most intimidating part of starting a business for the first time. I went with Akaunting because it looked very easy in comparing with others, especially QBO. However, as the core of Akaunting is single-entry, the acquisition of this app is very important because it helps us in an easy way the implantation of follow-ups regarding the turnover of our company. I don't like how the balance sheet is shown atm but devs are working on improving it based on my feedback so I can handle it. I love what Akaunting offers within the core and through this app. Manual journal entries resolve my bookkeeping errors. Trial balance is my favorite report and would recommend adding an aging report. Akaunting offers a single-entry bookkeeping service on its core platform which is great if one tries to keep their books. But, at our company, we have some investors and need to be more diligent to stakeholders. So, we have a crucial need to hold our books as a chart of accounts. 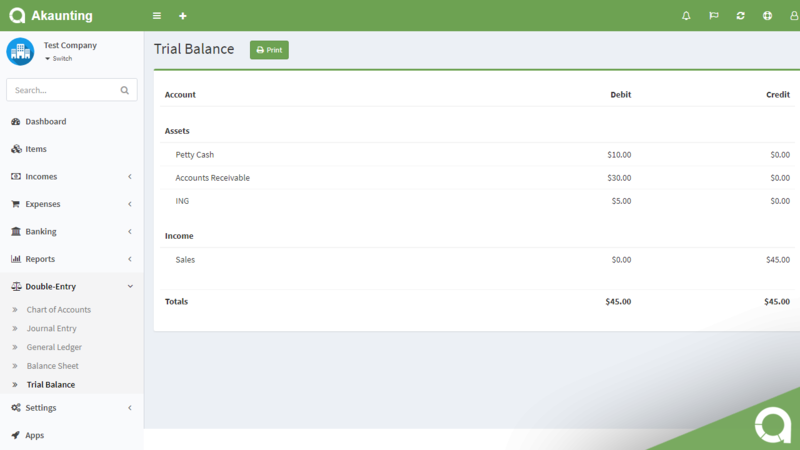 With the double-entry accounting app, we are able to make a transaction in two separate accounts for one transaction. We used to use Freshbooks for bookkeeping and realized that it was not easy to set the assets equal to the liabilities and the equity. So, we started to look for tools that offer double-entry service. The investors and management team is concerned about data privacy. And, we ended up using Akaunting, and it's double-entry app. Pros: Double-entry app increases financial accountability. Double entry bookkeeping was the missing feature of Akaunting and I'm glad to see it getting improved each day. Keep up the great work guys.